Strain hu-01 was isolated from a hospital environment in Zhejiang province, China, in October 2012. 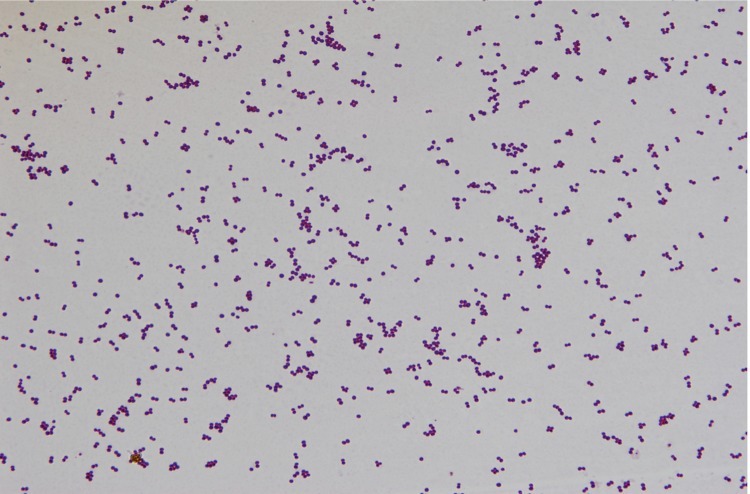 It is a Gram-positive, coccus-shaped bacterium that can grow on 5% sheep blood enriched Columbia agar (BioMérieux, Marcyl’Etoile, France) at 37°C. Growth occurs under either aerobic or anaerobic conditions. The optimum temperature for growth is 37 ºC, with a temperature range of 15-45 ºC (Table 1). Cell morphology, motility and sporulation were examined by using transmission electron (H-600, Hitachi) microscopy. 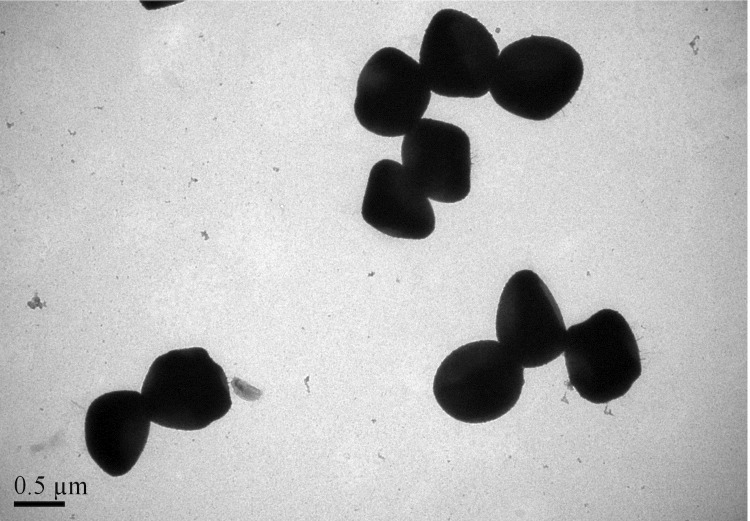 Cells of strain hu-01 are coccoidal, 0.6 to 1.2 μm in diameter, occurring predominantly singly or in pairs (Figure 1 and Figure 2). Comparative 16S rRNA gene sequence analysis by BLASTN [5,6] using the NCBI-NR/NT database revealed 94-99% sequence similarity to members of genus Staphylococcus. 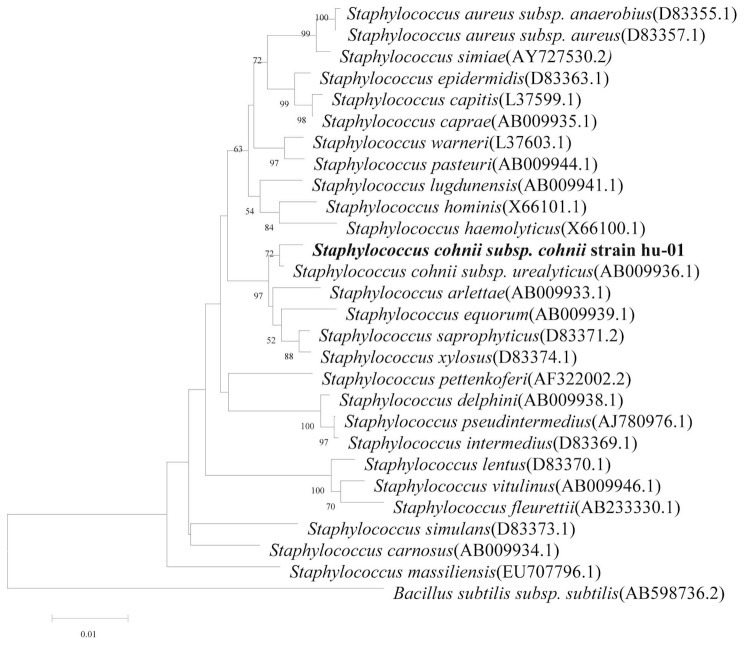 Neighbor-Joining phylogenetic analysis based on Kimura 2-parameter model indicated the strain hu-01 is most closely related the strain Staphylococcus cohnii subsp. urealyticus (AB009936.1) (Figure 3). Biochemical features were tested by using two automated systems, the Vitek2 Compact (bioMérieux, Marcy l'Etoile, France) and Phoenix 100 ID/AST system (Becton Dickinson Company [BD], Sparks, Maryland, USA). Positive reactions were obtained for D-fructose, trehalose, D-gluconic acid and D-mannitol. Negative reactions were observed for glucose, D-trehalose, D-sucrose, maltose, urea, cellobiose, glucoside, D-tagatose and maltotriose. This strain was susceptible to gentamicin, ciprofloxacin, levofloxacin, moxifloxacin, quinupristin, linezolid, vancomycin, tetracycline, tigecycline, nitrofurantoin, rifampicin, trimethoprim and resistant to cefoxitin, benzylpenicillin, oxacillin, erythromycin, clindamycin. S. conhii subsp .cohnii strain hu-01 was grown aerobically on Columbia blood agar base, at 37°C for 24h. Genomic DNA was extracted using the DNeasy blood and tissue kit (Qiagen, Germany), according to the manufacturer’s recommended protocol. The quantity of DNA was measured by the NanoDrop Spectrophotometer and Cubit. Then 10μg of DNA was sent to the State Key Laboratory for Diagnosis and Treatment of Infectious Disease at Zhejiang University for sequencing on a Hiseq2000 (Illumina, CA) sequencer. One DNA library was generated (500 bp insert size, with the Illumina adapter at both ends, detected by Agilent DNA analyzer 2100), then sequencing was performed by using an Illumina Hieseq 2000 genomic sequencer, with a 2×100 pair end sequencing strategy. A total of 1,103 M bp of sequence data was produced which was assessed for quality by the following criteria: 1) Reads linked to adapters at both end were considered as sequencing artifacts then removed. 2) Bases with a quality index lower than Q20 at both ends were trimmed. 3) Reads with ambiguous bases (N) were removed. 4) Single qualified reads were discarded (In this situation, one read is qualified but its mate is not). A total of 867.94 M clean filtered reads were assembled into scaffolds using the Velvet version 1.2.07 with parameters "-scaffolds no" , then we used a PAGIT flow  to prolong the initial contigs and correct sequencing errors. to arrive at a set of improved scaffolds. Predict genes were identified using Glimmer version 3.0 ,tRNAscan-SE version 1.21  was used to find tRNA genes, whereas ribosomal RNAs were found by using RNAmmer version 1.2 . To annotate predicted genes, we used HMMER version 3.0 , with parameters 'hmmscan -E 0.01 -domainE 0.01' to align genes against Pfam version 27.0  (only pfam-A was used) to find genes with conserved domains. The KAAS server  was used to assign translated amino acids (with genetic code table 11) into KEGG Orthology with SBH (single-directional best hit) method. Translated genes were aligned with the COG database using NCBI blastp (hits should have scores no less than 60, e-value is no more than 1e-6). To find genes with hypothetical or putative function, we aligned genes against NCBI nucleotide sequence database (nt database was downloaded at Sep 20, 2013) by using NCBI blastn, only if hits have an identity of no less than 0.95, coverage no less than 0.9, and the reference gene had an annotation of putative or hypothetical. To define genes with signal peptide, we use signalp version 4.1  to identify genes with signal peptide with default parameters except " -t gram+ ". TMHMM2.0  was used to identify genes with transmembrane helices. We thank Qiang Ye and Li Liang, Chinese Center of Medical Culture Collections /National Institutes for Food and Drug Control for providing the Biochemical features. This study was supported by the National Basic Research Program of China (973 program) (No. 2013CB531401) and the key Program of the National Natural Science Foundation of China (No. 81330011). Stefano M, Del Rosso A, Saldutto P, Paradiso Galatioto G, Vicentini C. Intrascrotal Abscess, Propionibacterium acnes and Staphylococcus cohnii ssp. cohnii: A Case Report and Review of the Literature. Case Rep Urol 2012;2012:313694. Johnson M, Zaretskaya I, Raytselis Y, Merezhuk Y, McGinnis S, Madden TL. NCBI BLAST: a better web interface. Nucleic Acids Res 2008;36(Web Server issue):W5-9. McGinnis S, Madden TL. BLAST: at the core of a powerful and diverse set of sequence analysis tools. Nucleic Acids Res 2004;32(Web Server issue):W20-5. Thompson JD, Gibson TJ, Higgins DG. Multiple sequence alignment using ClustalW and ClustalX. Curr Protoc Bioinformatics 2002;Chapter 2:Unit 2 3. Lowe TM, Eddy SR. tRNAscan-SE: a program for improved detection of transfer RNA genes in genomic sequence. Nucleic Acids Res 1997; 25:0955-964. Moriya Y, Itoh M, Okuda S, Yoshizawa AC, Kanehisa M. KAAS: an automatic genome annotation and pathway reconstruction server. Nucleic Acids Res 2007;35(Web Server issue):W182-5. Garrity GM, Holt JG. The Road Map to the Manual. In: Garrity GM, Boone DR, Castenholz RW (eds), Bergey's Manual of Systematic Bacteriolo-gy, Second Edition, Volume 1, Springer, New York, 2001, p. 119-169. Ludwig W, Schleifer KH, Whitman WB. Class I. Bacilli class nov. In: De Vos P, Garrity G, Jones D, Krieg NR, Ludwig W, Rainey FA, Schleifer KH, Whitman WB (eds), Bergey's Manual of Systemat-ic Bacteriology, Second Edition, Volume 3, Springer-Verlag, New York, 2009, p. 19-20. Schleifer KH, Bell JA. Family VIII. Staphylococcaceae fam. nov. In: De Vos P, Garrity G, Jones D, Krieg NR, Ludwig W, Rainey FA, Schleifer KH, Whitman WB (eds), Bergey's Manual of Systematic Bacteriology, Second Edi-tion, Volume 3, Springer-Verlag, New York, 2009, p. 392. Rosenbach FJ. In: Bergmann JF (ed), Microorganismen bei den Wund Infections Krankheiten des Menschen., Wiesbaden, 1884, p. 1-122. Baird-Parker AC. Genus II. Staphylococcus Rosenbach 1884, 18. In: Buchanan RE, Gibbons NE (eds), Bergey's Manual of Determinative Bacteriology, Eighth Edition, The Williams and Wil-kins Co., Baltimore, 1974, p. 483-489.